T-intelligence (Ti) continues the ‘Battle for Raqqa’ daily journal feed with a fresh new entry that will try to improve based on previously provided feedback from you, the audience. You can find the first volume, here, and read all about the methodology employed, the source/ reference policy and subsequently about the daily entries, stretching from the assault on June 6, 2017 to the later encirclement and to the sustained efforts within the Old Town, until August 1, 2017. The Syrian Democratic Forces (SDF), the multi-ethnic group of Kurdish, Arab, Turkmen or Syriac militias led by the Kurdish YPG, are supported by the U.S.-led International anti-ISIS Coalition ‘Inherent Resolve’. Upon finalizing the battle, Raqqa will be handed over the Raqqa Civil Council as an interim power that will end its term in 2018 when democratic elections are scheduled to be held. The U.S.-led Coalition backed Syrian Democratic Forces (SDF) have put an end to the ISIS rule in Raqqa and liberated the last districts controlled by the terror group. Click to ‘View as’ to see a wider format. What remains as tactical objectives for the triumphant party is to hunt the remaining sleeper cells, defuse IEDs and overall, restore security to the city. Inevitable, further small operations will continue, but the battle for the city is a sealed deal. In accordance to the protocol established before the battle, the city will be handed over to the Raqqa Civil Council, which took responsibility to assure the transition period until the first elections in 2018. The city will also be a part of the Democratic Federation of Northern Syria. Amid the final success, the latest fights had the SDF pitted against remaining jihadists around the Municipal Stadium, and throughout the central-northern parts. Weary and condemned to defeat, sustaining an enhanced combined air and ground assault, some 350 jihadists surrendered just today to the Coalition. The fighters were brought to a prison in Tabqa where they await trail. Additionally, there are rumors that some ISIS fighters have been allowed to leave for other territories (possibly Deir ez-Zor), especially after a video emerged showing them leaving the National Hospital. ISIS still controls areas in eastern Syria, (Deir ez-Zor province), contested by the Loyalists and the US-backed SDF; a small pocket in northern Hama disputed with Hay’at Tahrir al-Sham (unofficial Al-Qa’ida affiliate), and in Anbar province, notably around the cities of al-Qa’im and Rawah – pressured by the Iraqi Security Forces backed by the US-led Coalition. Most of the SDF personnel in Raqqa, especially the battle-hardened and experienced YPG elements, should normally be transferred to Deir ez-Zor province, in order to assist Operation Jazzira Storm, currently spearheaded by allied native Arab Sunni tribes, the Syrian Arab Coalition (SAC) and local of-shoot Deir ez-Zor Military Council (DMC). More about that operation here. The activist group ‘Raqqa is Slaughtered Silently’ that represented a resistance voice in the city throughout the years of Da’esh occupation, has issued another critical tweet addressing the number of civilian casualties (claims to be 1,000) and destruction left behind (claims 90%) by the SDF’s and YPG’s way of conducting the battle. While RISS had traditionally supplied interesting insights, their anti-SDF bias is widely known due to ethnic divergences over the region. Ti is not able to confirm the claimed facts and figures. liberated the self-proclaimed ‘capital’ of ISIS, Raqqa. Also, as a personal note, the Coalition destroyed the will of the enemy to continue fighting, a fact exposed by the repeated requests of Da’esh to be allowed to evacuate or surrender – something unprecedented some months ago. On the other hand, the price for this victory was costly. Airwars estimated in September that around 1,000 civilians were killed since June 6 at the start of the campaign; while the number is unconfirmed by the Coalition, which slammed Airwars in the past for unsubstantiated figures, we can still assess that at least 500-700 non-combatant deaths have occurred. While the population’s well-being is a central concern for all civilized actors, the use of human shields and mines by ISIS, and the difficulty in telling the difference between combatant and non-combatant on today’s hybrid battlefield has sparked significant difficulties, if not made it impossible to completely reduce the civilian loss. According to the the Telegraph, the Britain-based Syrian Observatory for Human Rights monitor put the overall death toll for the battle at 3,250, including fighters and civilians, but said hundreds were still missing or unaccounted for. Personal and open-source assessments of SDF casualties put estimates around 400. With the Raqqa Civil Council assuming the post-conflict reconstruction, the Raqqa Internal Security Forces (RISF) formed at Ain Issa on May 17, will patrol the streets of the city – overseeing a steady transition in the security landscape. Thank you for following this feed! Although October and September were poorly reported upon if not at all, the update frequency from June 6, 2017 to early September has been overall sustained on a daily basis. SDF victory celebration at the Al-Naim circle, a place where ISIS would conduct brutal executions and beheadings. After successful fights inner Raqqa and on its outskirts, the Syrian Democratic Forces (SDF) have boxed the remaining jihadists in the upper-north districts of the city. Yesterday on December 23rd, the US-backed forces have even liberated al-Firdous neighborhood reaching the southern end of the Municipal Stadium. The enemy is significantly weaken and lost morale, information suggest that many have already surrendered to the Coalition. 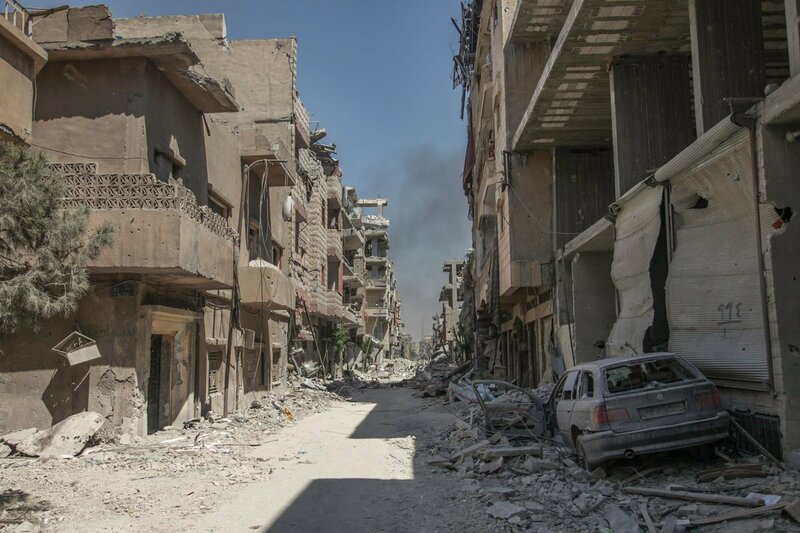 Just last week alone, the SDF captured 84 city blocks in Raqqa, marking a swift advance that maintained an intense effort that crippled the jihadist defensive lines and inner ranks throughout the city. The dramatic falls of ISIS in Raqqa intensified on September 19th, when the SDF captured the Grain Silos and closed the northern lines. Only so that the next day, the complete liberation of the ex-Division 17th HQ and the hills around it to be confirmed as secured. Subsequently, nearly 80 percent of the ex-self proclaimed capital of the “islamic state” has been liberated by the indigenous multi-ethnic SDF supported by the US-led Global Coalition against ISIS “Inherent Resolve”. Some sources indicate that the actual gains amount to 90 percent of Raqqa. One thing is sure, the battle for Raqqa will end this year. And with that, more assets and personnel will become available to contribute to the already launched operation “Cizre Storm” targeting ISIS fighters in Deir ez-Zor province. Fighting continue to concentrate on the Amin district of central Raqqa, where the SDF foiled an ISIS counter-attack. Also a significant amount of ammo and equipment was captured from the jihadists that was originally looted form the forces of the Syrian Regime. The U.S.-led Coalition conducted 11 strikes in Raqqa, destroyed 11 ISIS fighting positions, a command & control node and suppressed three fighting positions. The Civil Registry Building was liberated by the Syrian Democratic Forces (SDF) while in a previously liberated part of Sina’a, the Baghdad Gate was also fully cleared from ISIS elements. The Coalition backed forces advanced under the continuous harassment from ISIS snipers. The cohort is pushing towards the central parts of Raqqa. The U.S.-led Coalition conducted eight (8) strikes, destroyed 13 ISIS fighting positions; damaged five fighting positions and suppressed two fighting positions. Additional 38 strikes were reported in the next day’s strike release. The Coalition backed Syrian Democratic Forces (SDF) have managed to sustain a continuous advancement of carving into ISIS-held territory with no setback of successful counter-attacks from Da’esh. The paramount of this effort was marked on September 2 when the full liberation of Raqqa’s Great Mosque was announced consequently fully clearing the city’s Old Town. In this respect, on September 3, the SDF managed to liberate al-Moroor district, further boxing the jihadists between Raqqa’s open hills and the city’s northern limits, also eroding their lines of defense. CNN issued an exclusive drone video showing the destruction of Raqqa. On August 31st, the U.S.-led Coalition conducted 15 strikes in Raqqa, engaged 11 ISIS tactical units; destroyed 10 fighting positions, three logistics nodes, two vehicles and a command & control center. Additional 31 strikes were reported in the next day’s strike release. On September 1st, the U.S.-led Coalition conducted 17 strikes in Raqqa, engaged four ISIS tactical units; destroyed 16 fighting positions, three logistics nodes, two command & control nodes, and a SVBIED. Additional 12 strikes were reported in the next day’s strike release. Five more strikes were also reported on September 3rd. On September 2nd, the U.S.-led Coalition conducted 19 strikes in Raqqa, engaged five ISIS tactical units; destroyed five fighting positions, four logistics nodes, three IEDs, two staging areas, a mortar system, a vehicle, a command and control node. Additional five strikes were reported in the next day’s strike release. Ten more strikes were reported on September 4th. Also 11 more strikes were reported on the 5th. On September 3rd, the U.S.-led Coalition conducted 21 strikes in Raqqa, engaged nine ISIS tactical units; destroyed 13 fighting positions, two pieces of ISIS communications infrastructure, two vehicles, a SVBIED, a command & control node, and a logistics node. Additional four strikes were reported in the next day’s strike release. One more strike was reported on the 5th. Ten strikes were also reported on the 6th. On September 4th, the U.S.-led Coalition conducted 23 strikes in Raqqa, engaged seven ISIS tactical units; destroyed 20 fighting positions, four oil stills, three oil tanks, two logistics nodes, and a command & control node; and suppressed two fighting positions. One additional strikes were reported in the next day’s strike release. Additional 15 strikes were reported on the 6th. On September 5th, the U.S.-led Coalition conducted 25 strikes in Raqqa, engaged an ISIS tactical unit; destroyed 22 fighting positions, three ISIS communications infrastructure items, and a logistics node; damaged three fighting positions; and suppressed four fighting positions. Additional 15 strikes were reported in the next day’s strike release. In an interesting development, Syrian Democratic Forces (SDF) managed to cut cordon off Muroor district by capturing the main street that cuts between them in diagonal. Around 200 civilians were rescued by the SDF from the Children’s Hospital area and were transported to Kobani. Panorama Garden from Diriyah district was also captured by the advancing SDF. In addition to a large quantity of ammo and weapons captured from ISIS in southern Raqqa, the Turkish-made HAR 66 surfaces again to the terror group’s stockpile. U.S.-led Coalition conducted 17 strikes in Raqqa, engaging 11 ISIS tactical units; destroyed 15 fighting positions, two command & control nodes, a logistical node, and an IED factory. Additional 18 strikes were reported the next day. Two more strikes reported on September 1st. Snipers of the SDF have taken the rooftops of southern Muroor district and especially on top of the Mwasa Children’s Hospital to prevent unexpected counter-attacks by Da’esh. Other active fronts were Nahdah, were previous efforts to carve through ISIS-held territory proved successfully, al-Mooror and al-Tashih districts. Nowruz Ahmed from the military council of the U.S.-backed and YPG-led Syrian Democratic Forces (SDF) spoke to Reuters, in what she said was her first interview with the media, about the ‘Great Battle’ launched on June 6 to liberate Raqqa from ISIS. “We cannot determine the time period in which the battle of Raqqa will end precisely because war has its conditions. But we do not expect it to last long, and according to our plans the battle will not take longer than two months from now,” Ahmed said. U.S.-led Coalition conducted 46 strikes in Raqqa, engaging 30 ISIS tactical units; destroyed 66 fighting positions, five heavy machine guns, five vehicles, three anti-air systems, three medium machine guns, two command & control nodes, an ISIS HQ, a weapon cache, a SVBIED and damaged 8 fighting positions. Additional 16 strikes were reported in the next day’s strike release. The total now amounts to 62 strikes, just below the 63-strikes record reached the day before. Syrian Democratic Forces (SDF) fully liberated al-Mansur district, thereby completing the capture of Raqqa’s Old Town. The most difficult part of the anti-ISIS fight here is over; jihadists have been now pushed to other districts with the hope to further isolate them in open field, making them clean targets for the U.S.-led aviation. Commander of the Manbij Military Council (MMC) of the SDF was killed in clashes with ISIS in the battle for Raqqa. In parallel, SDF managed to liberate more streets in Nahdah district. U.S.-led Coalition conducted 12 strikes in Raqqa, engaging 6 ISIS tactical units; destroyed nine fighting positions, logistics nodes and a VBIED. Additional 48 strikes were reported in the next day’s strike release. Another 3 strikes were reported on the 30th. Total: 63 strikes, a new record for the Coalition’s activity. U.S. Special Presidential Envoy to the Global anti-ISIS Coalition confirmed that SDF have captured the Children’s Hospital in Maroor district, even though data about such a liberation debuted online two days ago, probably waited for the local forces to consolidate and implement a firm control. Coalition and Kurdish YPG launched a crackdown on Raqqa’s Hawks Brigade chief due to his cooperation with Regime forces during the Syrian Arab Army’s operations in rural southern Raqqa governorate. A group of 24 nurses who have been training for 4 months at Rojava’s Health Academy in Serêkaniyê arrived in Raqqa to complete the final phase of their education 12 nurses were sent to Raqqa’s eastern front while another 12 were dispatched to the east. U.S.-led Coalition conducted 29 strikes in Raqqa, engaging 13 ISIS tactical units; destroyed 19 fighting positions, five logistics nodes, three vehicles, three ISIS HQs, two VBIEDs, and two command & control nodes. Additional 24 strikes were reported in the next day’s strike release. Two new strikes were reported in the 29th strike release. #SDF controlled Zahraa School in Thakana neighborhood and the market area till Mitafawekin School. Liberation remains idle despite ongoing clashes in remaining Mansur district, Nahdah and around al-Maroon. Added humanitarian relief was made possible and more civilians managed to escape disputed areas for the safety of the city’s outskirts. De-mining efforts continue throughout liberated neighborhoods. U.S.-led Coalition conducted 18 strikes in Raqqa, engaging 4 ISIS tactical units; destroyed 14 fighting positions, six logistic nodes, and three vehicles. Additional 22 strikes were reported in the next day’s strike release. Another 2 strikes were reported on the 28th strike release. An early-morning offensive by the Syrian Democratice Forces (SDF) assaulted ISIS position in Nahdah district and liberating significant turf in the neighborhood. Through this military effort, the SDF have captured an ISIS-held munitions factory in the area, consisting of missiles and around 100 mortar rounds. Anti-radiation Kh 28, R-27 Vympel, and Totchka are some of them. Also, many of those missiles contain Cyrillic writing on them, most probably of Russian origin, scavenged by Da’esh from captured Regime bases and garrisons.U.S. B-52 carpet bomber was spotted above Raqqa’s airspace. SDF also advanced on Maroor district, freeing the Children’s Hospital. Around 24 jihadists were killed last night in al Mansur, al Moroor, Nadah and Bitani districts, while SDF received 3 casualties. Fighting throughout the day saw the Syrian democratic Forces attempting to push the frontline as westwards as possible in Mansur district. Air strikes and artillery targeted the area around the “Security Box” in a bid to soften the terrorist’s defensive positions. Clashes were also reported in Nahdah neighborhood and resulted in 5 losses for ISIS. Roj Mine Control Organization (RMCO) defused many ISIS mines (IEDs) planted inside Raqqa civillians homes to slow down SDF advance in city. 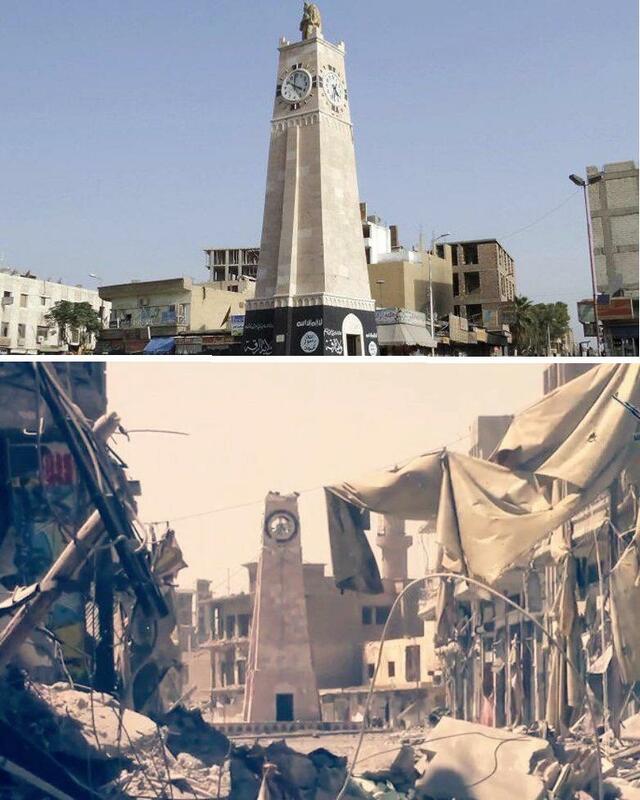 Clocktower in al-Rashid district: up (2015) vs. down (present). SDF also liberated the square around the Clock Tower, where ISIS has been holding the public executions and were the heads or bodies of those killed were exposed. The United Nations called for a humanitarian pause to allow an estimated 20,000 trapped civilians to escape from the Syrian city of Raqqa, and urged the U.S.-led coalition to rein in air strikes that have caused casualties. However, ISIS is not bound to any kind of pause, such an option is unrealistic. In an interview for ARA News, Bret McGurk said that around 2,000 ISIS fighters are left in Raqqa, and that city is 55-60% liberated by the SDF. Also, he pointed out that the Coalition gathered around 10 Terrabytes of intelligence on ISIS, and that together with Interpol they have built a data base of 19,000 known foreign fighters, local assets, sympathizers etc. U.S.-led Coalition conducted 9 strikes in Raqqa, engaged 7 ISIS tactical units; destroyed 11 fighting positions a vehicle. In an extraordinary course of events, SDF managed to defeat ISIS in the Old Town and capture the rest of Rashid district, and therefore almost the entire territory walled within the city’s medieval core. Through this, the SDF made sure that the closing fights of this battle will not be prolonged or stalled as the ISF did in Western Mosul’s old districts, therefore pushing the jihadists in the open. Dozens of civilians were able to escape the now near-fully liberated old town. The U.S.-led Coalition conducted 14 strikes in Raqqa, engaged 13 ISIS tactical units; destroyed 26 fighting positions, an ISIS HQ, a command & control node, and engineering equipment used by the jihadists. Additional 27 strikes were reported in the next day’s strike release. Three (3) more strike were also reported in the 26th strike release. One more strikes reported in the 27th strike release. Clashes occurred all over Raqqa. ISIS suicide bomber Abu Yusuf al-Hindi detonated himself in north-eastern Romaniah district, a much more lower intensity location of the battle. In the districts of Mahda and Muroor SDF managed to advance and inflict casualties in the jihadists. Thousands of civilians have been vaccinated in Raqqa amid Polio outbreaks. U.S.-led Coalition conducted 21 strikes in Raqqa, engaged 14 ISIS tactical units; destroyed 22 fighting positions, two UAS staging areas, two heavy machine guns, a vehicle and an explosive cache on August 20th. Additional 33 strikes reported in the next day’s strike release. U.S.-led Coalition conducted 20 strikes in Raqqa, engaged 13 ISIS tactical units; destroyed 24 fighting positions, a vehicle, a logistical node and ISIS communication towers. Additional 21 strikes were reported in the next day’s strike release. Additional 2 strikes were reported on the 24th. Other 3 strikes reported only in the 26th strike release. Syrian Democratic Forces captured several checkpoints both in Rashed neighborhood and Derayah. The fighters advance slowly but surely, in order to avoid IEDs and other booby-traps set up by ISIS. 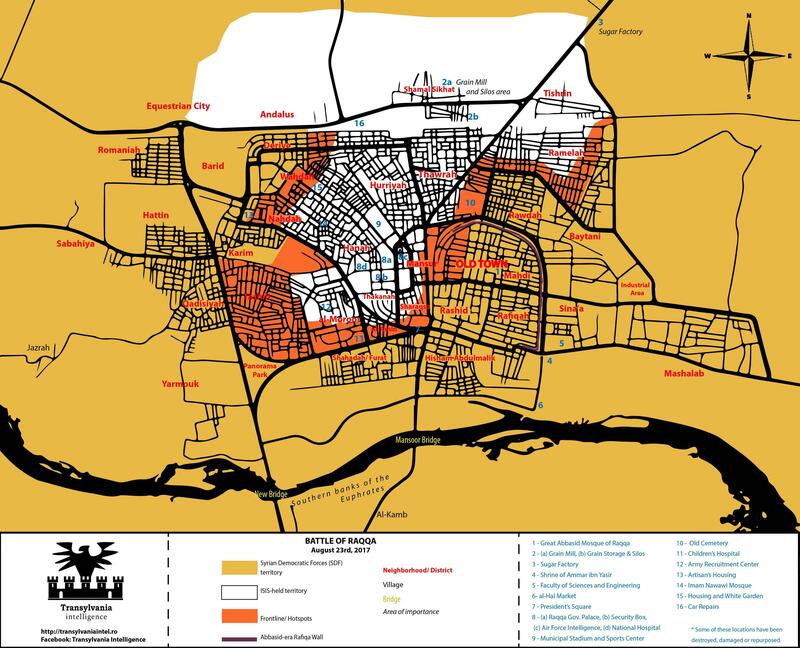 While the positions in the Old Town are on one hand, consolidated by the half controlled by SDF, and disputed in those streets in the western parts, still under ISIS control, the SDF distributed leaflets in Mansoor informing civilians to evacuate and the jihadists to surrender. U.S.-led Coalition conducted 5 strikes in Raqqa, engaged 2 ISIS tactical units; destroyed 3 fighting positions. Additional 36 strikes were reported in the next day’s strike release, that engaged 22 ISIS tactical units, destroyed 29 fighting positions, and several other assets or battle vectors. Additional 6 strike reported on the 21st. One additional strikes reported on the 22nd. Another additional strikes reported in the 26th strike release. A new batch of supplies arrive in Northern Syria on route to support the anti-ISIS effort in Raqqa. Special Presidential Envoy to the anti-ISIS Coalition, Brett McGurk met with representatives of the Raqqa Civil Council in Ain Issa. U.S.-led Coalition conducted 19 strikes in Raqqa, engaged 17 ISIS tactical units; destroyed 20 positions, anti-air system, and a command & control node. Additional 20 strikes were reported in the next day’s strike release. Additional 4 strikes were were reported on the 20th. One additional strike reported on the 21st. Clashes between the SDF and ISIS continued throughout the night in Shahadeh district. US-backed forces managed to take an ammunition depot from the jihadists in that area. In the city center, SDF manages to hold and consolidate the ground capture in the Old Town and captures the entire al-Quwalti street that separates Rifaq and Mahdi neighborhoods. On the other hand, significant attempt of counter-attack launched by ISIS were dealt with success by the SDF on several fronts, while also managing to open several safe passages for civilians to flee. U.S.-led Coalition conducted 18 strikes in Raqqa, engaged 12 ISIS tactical units; destroyed 29 fighting positions, three ISIS communication lines and two logistical nodes. Additional 19 strikes were reported in the next day’s strike release. Additional 3 strikes were reported on the 19th. Clashes continued in al Mansur, al Rashid, Shahadeh and Darayeh neighborhoods, killing 46 jihadists. Four SVBIED have been also neutralized before they could be detonated. OIR Spokesperson said that 55% of the city is now in SDF hands. According to an article in Reuters, The current number of Arabs in the SDF is around 24,000 with 31,000 Kurds; just since November, U.S. trained 5,000 local Arabs from Raqqa to join the ranks of SDF. This day marked the 1 year anniversary of the liberation of Manbij, significant celebrations took place in the city, now administered by the Federation of Northern Syria. Interesting war stories of the SDF in Raqqa can be read through this insight-full article. U.S.-led Coalition conducted 20 strikes in Raqqa, engaged 16 ISIS tactical units; destroyed 17 fighting positions, a logistics node, an IED, a command & control node, an UAS and a vehicle. Additional 23 strikes were also reported in the next day’s strike release. Additional 5 strikes were reported on 18th strike release. One more strike was reported in the 26th strike release. Around 95 jihadts have been neutralized in the intense and ongoing clashes in Raqqa’s Old Town. Humanitarian situations in some parts have improved, many civilians managing to escape, however the overall outlook is dire, being the 62nd day without water. SDF managed to destroy an ISIS SVBIED before detonating itself, close to the Children’s Hospital in near the Security Box, near Shahadah/ Furat, where the jihadists tried to open an offensive. 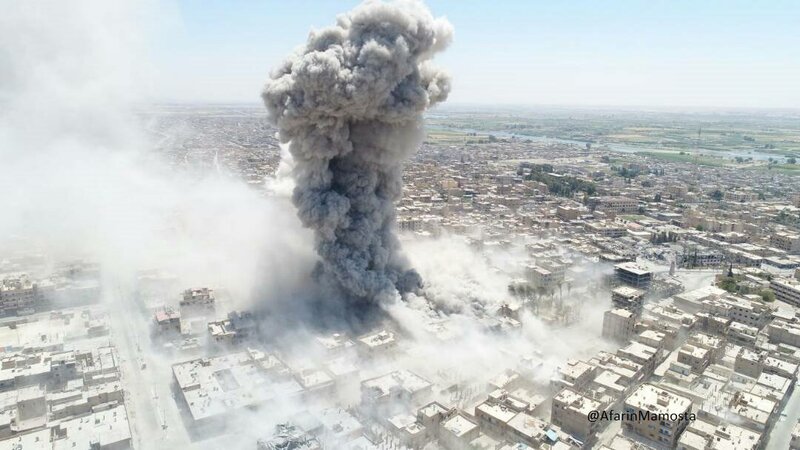 Drone footage captures moment when U.S. air strikes hits ISIS position in Raqqa. U.S.-led Coalition conducted 11 strikes against ISIS in Raqqa, engaging seven ISIS tactical units; destroying 30 fighting positions, a logistics node and a UAS. Additional 37 strikes were reported in the next day’s strike release. Another 4 strikes were reported in the strike release of August 17th. This marks the day with the highest air strike count from the entire campaign: 52. In this long 10-days span fights continued in the disputed Old Town as well as in the near-central districts. Little progress has been achieved given the fortified positions of the jihadists and the urbanized area that the SDF is now operating in. Without a doubt, the U.S-backed fighters are well deep into the most difficult terrain of the anti-ISIS effort, needing to push the jihadists out of the city and off the Earth, while also preventing casualties both in SDF and of the civilians.
. SDF fighters congratulated and saluted each other as they met. Capitalizing on this new enforced posture of SDF personnel south of the Old Town, sustained operations have began targeting the city’s central districts with night raids, air strikes and shelling. In the meanwhile, SVBIED attacks from ISIS tried to weaken SDF presence in the western parts of the Old Town, even near the Old Mosque. 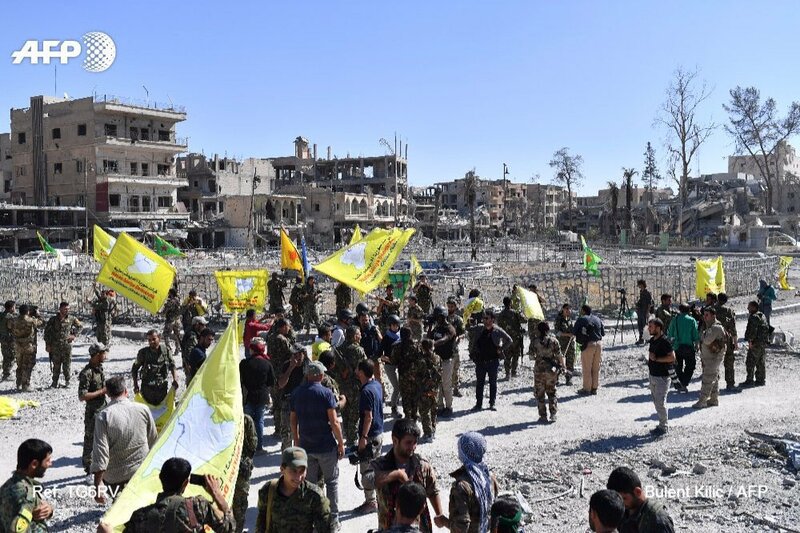 Despite these efforts, on March 12, SDF managed to capture Mahdi and al-Rifa districts, which amount to more than half of Raqqa’s Old Town, including the Old Mosque. These is not just an intelligence tactical plan, but also an outstanding achievement that the SDF managed to actually apply it. 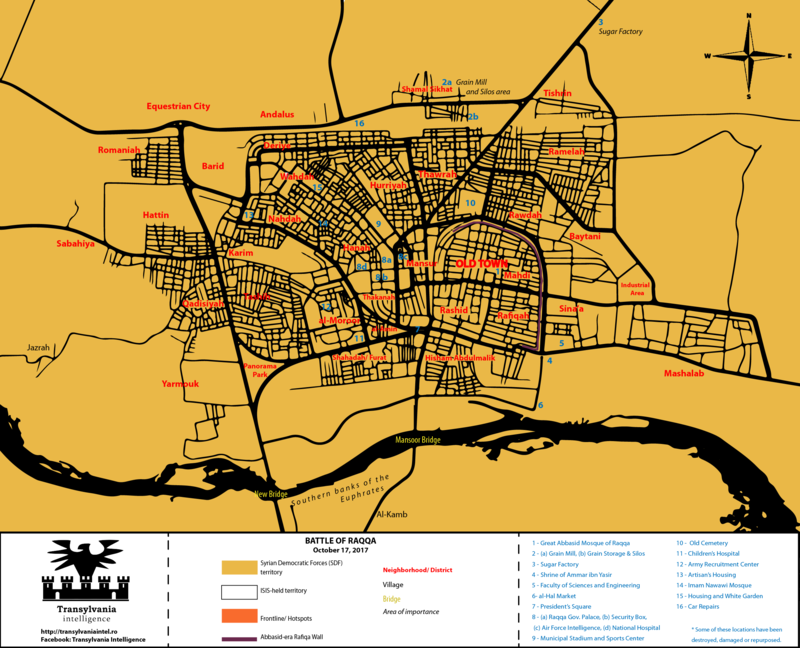 In contrast, Iraqi Security Force (ISF) did a major mistake by cornering the last remnants of ISIS in the Old Town of Mosul, heavily urbanized and basically a maze of narrow streets packed with IEDs, tight corners, tall buildings and enough cover and door-to-door situations, to stall the battle for months and cost additional lives of civilians and soldiers. 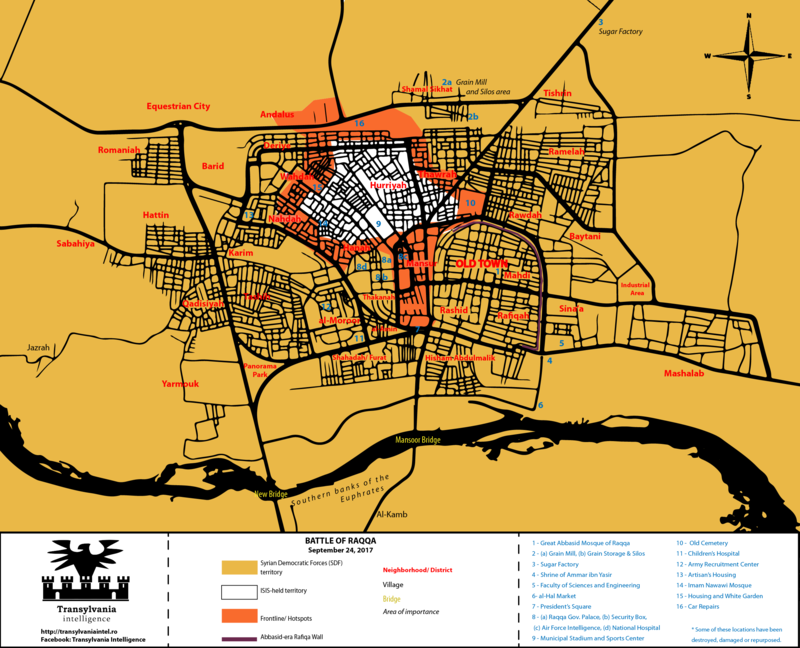 The last four three months of the battle for Mosul took place in the Old Town. What SDF is attempting (successfully for now) is conduct an early liberation of the Old Town, in order to push the last remnants of ISIS in the opened areas of Raqqa, which make them an easier target for the sweep & clean closing operations of the battle. Before the liberation of Mahdi and al-Rifa, сommander of the US-backed Syrian Democratic Forces (SDF), Hafal Jabbar, said that SDF need 4 more months to capture Raqqa city. And according to U.S. Special Presidential Envoy to the anti-ISIS Coalition, Brett McGurk, there are ‘2,000 ISIS fighters left in Raqqa’ while Colonel Ryan Dillon, a Coalition spokesperson said: “Fighting in Raqqa continues to be intense, as fanatical ISIS dead-enders and foreign terrorist fighters left to die use the dense urban environment to try to cling to territory”. In Derek, self-proclaimed Federation of Northern Syria, authorities now print school manuals in Kurdish. On the 13th and 14th, desperate SVBIED attacks of ISIS in consolidated western district of Romaniah, Abdul Malik and counter-offensive in the Old Town, that failed to repeal SDF personnel from their positions. Coalition uses Apache attack helicopters to rain down hell on ISIS positions in Raqqa. August 4th – 27 strikes engaged 19 ISIS tactical units; destroyed 17 fighting positions, three tactical vehicles, a vehicle, two heavy machine guns, a mortar system, a weapon cache, a command & control node, a SVBIED facility, and a SVBIED. Additional 4 strikes were reported in the next day’s strike release. August 5h – 21 strikes engaged 15 ISIS tactical units; destroyed 13 fighting positions, two vehicles, two heavy machine guns, a front-end loader, UAV site, and a sniper position. Additional 5 strikes were reported in the next day’s strike release. Another 2 strikes was reported in the strike release on the 7th. August 6th – 9 strikes engaged 9 ISIS tactical units; destroyed 7 fighting positions, an HQ and a SVBIED facility. Additional 8 strikes were reported in the next day’s strike release. August 7th – 18 strikes engaged 16 ISIS tactical units; destroyed 17 fighting positions, a tunnel and two vehicles. Additional 6 strikes were reported in the next day’s strike release. August 8th – 12 strikes engaged 10 ISIS tactical units; destroyed 7 fighting positions, two vehicles, one front-end loader, an ISIS communication tower and communication equipment. Additional 7 strikes were reported in the next day’s strike release. August 9th– 14 strikes engaged 9 ISIS tactical units; destroyed 27 fighting positions, five command & control nodes, two heavy machine guns, a mortar system, a vehicle, and an IED factory. Additional 16 strikes were reported in the next day’s strike release. August 10th – 33 strikes engaged 14 ISIS tactical units; destroyed 21 fighting positions, four command & control nodes, three ISIS communication nodes, two IEDs, a logistics node and an ISIS communication facility. Additional 2 strikes were reported in the next day’s strike release. August 11th – 26 strikes engaged 19 ISIS tactical units; destroyed 35 fighting positions, two vehicles, an HQ, and a communication line. Additional 11 strikes were reported in the next day’s strike release. August 12 – 15 strikes engaged 14 ISIS tactical units; destroyed 3 command & control nodes, two HQs, an UAV launch site and a vehicle. Additional 21 strikes were reported in the next day’s strike release. August 13 – 16 strikes engaged 11 ISIS tactical units; destroyed 3 fighting positions, an anti-aircraft artillery system, a logistical node, a heavy machine gun, a vehicle and an IED. Just one additional strike was reported in the next day’s strike release. Another 2 strikes were reported only on the 26th strike release. August 14 – 27 strikes engaged 19 ISIS tactical units; destroyed 59 fighting positions, two heavy machine guns, a mortar system, an IED and a logistical node. Additional 32 strikes were reported in the next day’s strike release. This might be the day with the highest air strike count since the battle started: 59. U.S.-led Coalition conducted 15 strikes against ISIS in Raqqa, engaging 10 ISIS tactical units; destroyed seven fighting positions, three mortar systems, two sections of Rafiqah wall, two vehicles, two anti-air artillery, heavy machine gun, and explosive cache; damaged five supply routes; and suppressed a jihadist tactical unit. Additional 13 strikes on August 3rd were reported in the next day’s strike release. Another strike was reported on the strike released issued on the 5th. SDF elements further push to consolidate on their wins in all fronts. In Raqqa’s Old Town, they assault the Ateeq Mosque, where according to Raqqa 24, was followed a counter-attack that killed 11 SDF elements. In Rawda district, SDF fighters foiled an IS attack with 2 VBIEDs that they destroyed before reaching their targets. While limited fire fights also took place south of the Sugar Factory. Furthermore, SDF has liberated al-Muna Mosque, Bustan Garden, Micro-bus Station and Kerala from ISIS in the neighborhood of Hisham Bin Abdulmelik, southern Raqqa and north of the Euphrates. Eight jihadists have been neutralized. Also, SDF is working on opening humanitarian corridors by conducting sweep&clean ops in Nazlat Shahadah. ISIS claimed two SVBIED attacks on SDF positions in Muklathla district, one suicide bomber looks underage. Attack only injured fighters, reporter capture immediate aftermath on tape. U.S.-led Coalition conducted 14 strikes against ISIS in Raqqa, engaging 10 tactical units, destroyed 9 fighting positions, two vehicles, a supply cache, a SVBIED, a mortar position, an ISIS UAS site, and a electricity generator. Four additional strikes on August 2nd have been reported in the next day’s strike release. The defensive posture of ISIS in Raqqa has become weary and seasoned. Syrian Democratic Forces (SDF) managed to pull huge wins in the southern sectors. For one, they managed to capture the district of Nazlat Shahadah, while also managed to push through the ex-Government headquarters located in Barid, therefor securing the banks north of the New Bridge. On the other hand, SDF captured the Political Security Zone in Hisham bin Abdulmalik neighborhood in order to link the two southern flank of the city, further tightening the grip on the Old Town. A former rapper now ISIS member threatens Rome and Istanbul on a video addressing Donald Trump, while their propaganda also released several new videos showing SVBIED attacks against SDF targets in Raqqa. Arab Sunni Rebel group, part of SDF, Jaysh al Thuwar will include female fighters within their ranks taking the example of YPG with YPJ. U.S.-led Coalition conducted 7 strikes against ISIS in Raqqa, engaging 4 tactical units, destroyed 4 fighting positions, two ISIS headquarters, and IED, a ammunition cache, and a fuel supply point. Additional 17 strikes conducted on the 1st, have only been reported on the next day.